I was so excited I couldn't wait to try it. So no pics of the lathe in a "pristine" state. This is Harbor Freight's "8" x 12" Benchtop Wood Lathe", item number 95607-7VGA. It came today. I unboxed it and had a 1x2 of some really light and soft pine chucked in 10 minutes. The variable speed is awesome. It's huge to be able to change speeds on the fly while cutting instead of having to stop, move the belt, start again and hope you still have your groove. In this horribly soft wood I used a 1/2" skew chisel and cut it down into a cylinder, then cut a captive ring. My first! 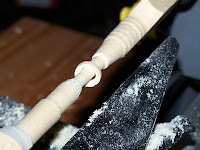 The old 40" HF lathe wasn't stable enough to let me achieve this in any wood, let alone something as soft as this. I can't wait to see what else I can make! What are your thoughts about the Harbor Freight mini lathe now that you've had it for several projects?? What are its strengths (besides price)? What are it's weaknesses? 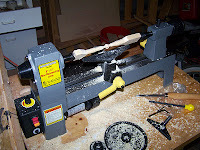 I am interested in this model as an entry level lathe for turning Duck Calls. Have enjoyed reading through your blog! It's a good idea for me to provide an update after a few months. Strengths: A good solid small lathe. I haven't had any reason to complain yet. Standard sized fittings such as the 1/2" tool mount and MT1 head and tail stocks mean I can get accessories. Weaknesses: MT1, while a standard size, isn't as common as MT2. So some stuff just plain isn't available for it. But most things are, such as drill chucks, various centers, etc. Also, there's no bed extension available for it that I've found. I'd like to add a bit of length for tool handles and such. I recently sold my first higher end pen (herringbone walnut Navigator - $125) so there's no question it works and works well.